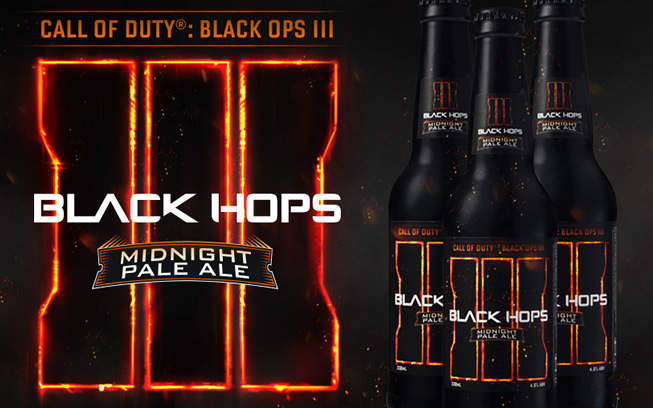 Sydney, Australia – 28th October, 2015: To celebrate the upcoming release of the highly anticipated Call of Duty: Black Ops III on the 6th November, three young Aussie craft brewers from the Gold Coast have created a world first, limited edition Call of Duty: Black Hops III – Midnight Pale Ale. The beer will be available to purchase in limited quantities, exclusively in Australia through www.beerbud.com.au/blackhopsIII from the 2nd November. Gold Coast trio, Michael McGovern, Eddie Oldfield and Dan Norris started Black Hops Brewing on the 2nd November, 2014. 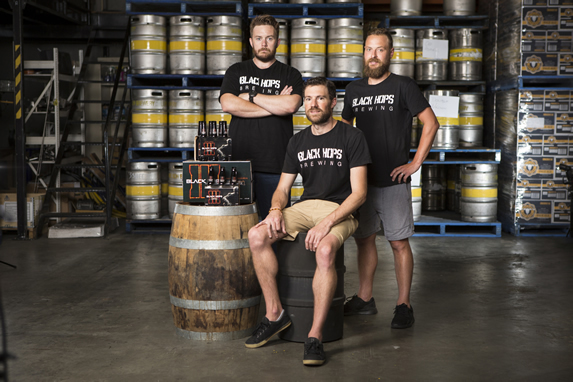 In just 12 months they have gone from home brewing in their garage and selling their beer in local pubs, to partnering with the biggest entertainment franchise in the world to create Call of Duty: Black Hops III Midnight Pale Ale. “When Activision first contacted us we thought it was a hoax and had no idea that would turn into this amazing partnership. We love beer and we love video games, especially Call of Duty, so when the opportunity to create Black Hops III to celebrate the launch of the new game came up, we jumped at it” said Michael ‘Govs’ McGovern, Head Brewer and Co-Founder of Black Hops Brewing. Black Hops Brewing has been making waves in the Australian craft beer industry, sharing every step of their ambitious startup business online via their blog and social media channels. “Black Hops Brewing is an ironic name because we’re intentionally the least covert operation; we even put our business plan online to help others learn how to get started. We love the craft brewery scene and hopefully we can help grow it by making it easier for others to get involved. We’re massive Call of Duty fans too, so our name is also a subtle nod to the Black Ops franchise.” Said Black Hops Brewing Co-Founder, Eddie Oldfield. Govs, Eddie and Dan wanted to create a unique beer that reflected both the creativity of the brewery and Call of Duty: Black Ops III, so they set about using a combination of special ingredients sourced from around the world and their knowledge of unique craft brewing techniques to take a classic American-style pale ale and paint it black. “The beer is black in colour, but light and refreshing like a traditional pale ale, perfect for the Aussie summer. It’s made with an ingredient new to the market from the U.S. called “midnight wheat” a roasted de-husked wheat grain that provides a rich dark colour without the bitterness you would expect from a dark beer. It messes with your mind, a bit like the Black Ops storyline I guess.” Said Govs. With a rapidly expanding business, Black Hops Brewing are excited to release Call of Duty: Black Hops III – Midnight Pale Ale on the 2nd November. “We’re not used to being covert but we kept this project a secret for the past 6 months, so we’re stoked to get it out there. Hopefully this will bring the up and coming Gold Coast craft beer scene some well-deserved attention too”. Said Black Hops Brewing Co-Founder, Dan Norris. Call of Duty: Black Hops III Midnight Pale Ale will be available in limited quantities, exclusively via www.beerbud.com.au/blackhopsIII in both six packs and 24 bottle cartons from 1:00pm on 2nd November, 2015. Call of Duty: Black Ops III is in development at Treyarch for PlayStation®4 computer entertainment system, Xbox One, the all-in-one game and entertainment system from Microsoft and PC. You can download additional Black Hops III assets here, here & here.